A former Portuguese colony, Angola, known formally as the Republic of Angola, was ravaged by a quarter-century of civil war between a pro-Soviet government that controlled the capital and coastal areas and a pro-democracy guerrilla movement that held the interior regions. After the death of guerrilla leader Jonas Savimbi in 2002, a nominal multiparty republic was set up, but free elections have yet to be held. Political activity by the opposition has sometimes been met with violence, and the state controls most of the mass media. China has invested huge sums in reconstruction, and is now Angola's biggest oil export market. It thus wields considerable influence, and the opposition fears that the government is adopting the Chinese political and economic model. Though Angola has considerable natural resources, especially oil and diamonds, mismanagement of the government funds they generated has resulted in Angola remaining among the world's poorest nations, and much still needs to be done to reconstruct the infrastructure destroyed during the civil war. In 1482, when the Portuguese first landed in what is now northern Angola, they encountered the Kingdom of the Congo, which stretched from modern Gabon in the north to the Kwanza River in the south. South of this kingdom were various important states. Ndongo was the most significant, and modern Angola derives its name from the Ndongo word ngola (king). The Portuguese gradually took control of the coastal strip throughout the sixteenth century by a series of treaties and wars and had conquered the Congo and Ndongo states by 1671. Full Portuguese administrative control of the interior did not occur until the beginning of the twentieth century. Portugal's primary interest in Angola quickly turned to slavery, which began with the purchase from African chiefs of people to work on sugar plantations in São Tomé, Principé, and Brazil. Many scholars agree that by the nineteenth century, Angola was the largest source of slaves not only for Brazil but also the Americas, including the United States. By the end of the nineteenth century, a massive forced labor system had replaced formal slavery and would continue until outlawed in 1961. Forced labor provided the basis for development of a plantation economy and then the mining sector. It was also used to construct three railroads from the coast to the interior. Colonial economic development did not translate into social development for native Angolans. The Portuguese regime encouraged white immigration, especially after 1950, which intensified racial antagonisms. As decolonization progressed elsewhere in Africa, Portugal rejected independence and treated its African colonies as overseas provinces. Consequently, three independence movements emerged: the Popular Movement for the Liberation of Angola (MPLA) led by Agostinho Neto, with a base among Kimbundu and the mixed-race intelligentsia of Luanda, and links to communist parties in Portugal and the Soviet bloc; the National Front for the Liberation of Angola (FNLA), led by Holden Roberto with an ethnic base in the Bakongo region of the north and links to the United States and the Mobutu regime in Kinshasa; and the National Union for the Total Independence of Angola (UNITA), led by Jonas Savimbi with an ethnic and regional base in the Ovimbundu heartland in the center of the country. After the 1974 coup in Portugal, the military government promptly agreed to hand over power to a coalition of the three movements. The ideological differences between the three movements eventually led to armed conflict, with FNLA and UNITA forces, encouraged by their respective international supporters, attempting to wrest control of Luanda from the MPLA. The intervention of troops from South Africa on behalf of UNITA and Zaire on behalf of the FNLA in September and October 1975 and the MPLA's importation of Cuban troops in November, effectively internationalized the conflict. Retaining control of Luanda, the coastal strip, and increasingly lucrative oil fields in Cabinda, the MPLA declared independence on November 11, 1975—the day the Portuguese abandoned the capital. UNITA and the FNLA formed a rival coalition government based in the interior city of Huambo. Agostinho Neto became the first president of the MPLA government that was recognized by the United Nations in 1976. Upon his death in 1979, then-Planning Minister José Eduardo dos Santos became president, a position he still holds. The FNLA's military failures led to its increasing marginalization, but civil war between UNITA and the MPLA continued until 1989. For much of this time, UNITA controlled vast swaths of the interior and was backed by U.S. resources and South African troops. Similarly, tens of thousands of Cuban troops remained to support the MPLA. A U.S.-brokered agreement resulted in withdrawal of foreign troops in 1989 and led to the Bicesse Accord in 1991, which spelled out an electoral process for a democratic Angola under the supervision of the United Nations. UNITA leader Savimbi rejected the results of the first round of the presidential election in 1992, charging fraud, and returned to war. Another peace accord, known as the Lusaka Protocol, was brokered in Lusaka, Zambia, and signed in 1994. This agreement, too, collapsed. The Angolan military launched a massive offensive in 1999 that destroyed UNITA's conventional capacity and recaptured all the major cities previously held by Savimbi's forces. Savimbi returned to guerrilla tactics, which continued until his death in combat in February 2002. Soon after, a cease-fire agreement was reached. The Front for the Liberation of the Enclave of Cabinda (FLEC), formed in 1974, rejected the agreement that included Cabinda as part of Angola at independence. In 1975, FLEC began guerilla attacks against government targets and kidnapped foreigners in an effort to press for an independent Cabindan state. The simmering revolt finally ended with the signing of a memorandum of understanding in 2006. Angola changed from a one-party Marxist-Leninist system ruled by the MPLA to a nominal multiparty democracy following the 1992 elections, in which President José Eduardo dos Santos won the first-round election with more than 49 percent of the vote to Jonas Savimbi's 40 percent; a runoff never took place. The executive branch of the government is composed of the president, the prime minister, and a council of ministers. The government is based on ordinances, decrees, and decisions issued by the president and his ministers or through legislation produced by the national assembly and approved by the president. The parliament is generally subordinate to the executive. The Constitutional Law of 1992 establishes the broad outlines of government structure and delineates the rights and duties of citizens. The legal system is weak and fragmented, and courts operate in only 12 of more than 140 municipalities. A supreme court serves as the appellate tribunal; a constitutional court with powers of judicial review has never been formed, despite its authorization. After the 2002 cease-fire, UNITA assumed the role of major opposition party, but few opportunities exist for opposition parties to challenge MPLA dominance. Although the political situation seems to be stabilizing, dos Santos still has not allowed regular democratic processes. The president announced the government's intention to hold elections in 2006, but the necessary preliminary steps were not completed that year. A voter registration awareness campaign was begun late in 2006 and was to run until mid-2007. Angola is bordered by Namibia to the south, Zambia to the east, the Democratic Republic of the Congo to the northeast, and the South Atlantic Ocean to the west. 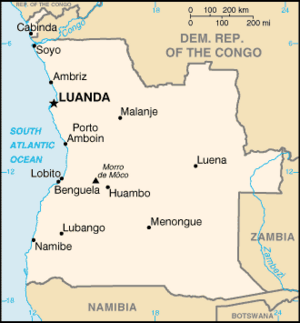 Angola's capital, Luanda, lies on the Atlantic coast in the northwest of the country. The oil-rich province of Cabinda is separated from the rest of the nation by the Congo River and a narrow strip of land belonging to the Democratic Republic of the Congo. Angola is divided into an arid coastal strip stretching from Namibia to Luanda; a wet, interior highland; a dry savanna in the interior south and southeast; and rainforests in the north and in Cabinda. The Zambezi River and several tributaries of the Congo River have their sources in Angola. The economy remains in disarray because of the prolonged warfare. Despite its abundant natural resources, output per capita is among the world's lowest. Subsistence agriculture provides the main livelihood for 85 percent of the population. Oil production and its supporting activities are vital to the economy, contributing about 45 percent of GDP and 90 percent of exports. In 2006, Angola became a member of the Organization of the Petroleum Exporting Countries (OPEC). Control of the oil industry is consolidated in Sonangol Group, a conglomerate owned by the government. Millions of land mines remain, and many farmers are reluctant to return to their fields. As a result, half of the country's food must still be imported. The long period of internal strife discouraged investment outside the petroleum sector. Nevertheless, increased oil production supported 19 percent growth in 2005. That was expected to continue to grow. Recent anti-corruption steps and greater transparency are considered encouraging, though more needs to be done. Unemployment is still high at around 22 to 27 percent. A strategic partnership with China was set in motion with the advent of peace in 2002. Chinese companies have made huge investments, especially in the construction and metallurgical sectors. In 2005, the government started using a $2 billion line of credit from China to rebuild Angola's public infrastructure. Trade with China was worth $7 billion in 2005. Consumer inflation declined from 325 percent in 2000 to about 18 percent in 2005, but the stabilization policy places pressure on international net liquidity. To fully take advantage of its rich national resources—gold, diamonds, extensive forests, Atlantic fisheries, and large oil deposits—Angola will need to continue reforming government policies and reducing corruption. The civil war ravaged the country's political institutions and resulted in massive internal displacement. Many people fled as refugees to neighboring countries. By 2005, after peace was restored, an estimated four million people had returned to their homes but forty thousand to sixty thousand remained as internally displaced persons (IDPs). 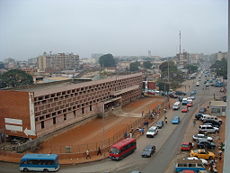 Daily conditions of life throughout the country, especially Luanda (with a population of approximately four million), mirror the collapse of government as well as many social institutions. The agricultural, health care, education, water, and transportation infrastructures were destroyed during the war. Hospitals lack medicines or basic equipment, schools operate without books, and public employees often do without basic supplies for their day-to-day work. An estimated 80,000 Angolans are victims of land mines. Angola has three main ethnic groups, each speaking a Bantu language: Ovimbundu (37 percent), Kimbundu (25 percent), and Bakongo (13 percent). Mestiços (Angolans of mixed European and African origins) amount to about 2 percent, with a small (1 percent) population of whites. Portuguese make up the largest non-Angolan population, with at least 30,000. Portuguese is both the official and predominant language, spoken in the homes of about two-thirds of the population and as a secondary language by many more. Catholicism remains the dominant religion, although an increasing number of churches are claiming more followers, particularly evangelicals. ↑ 2.0 2.1 2.2 2.3 Angola. International Monetary Fund. Retrieved 2011-04-12. ↑ Gini Index. World Bank. Retrieved 2 March 2011. Human Rights Watch. Angola: New OPEC Member Should Tackle Corruption Not Critics. December 15, 2006. Retrieved July 11, 2007. United Nations High Commissioner for Refugees. Angola. Retrieved July 11, 2007. United Nations Office for the Coordination of Humanitarian Affairs. Angola: Humanitarian News and Analysis. Integrated Regional Information Networks. Retrieved July 11, 2007. U.S. Department of State. Angola. Retrieved July 11, 2007. This page was last modified on 22 March 2016, at 14:55.